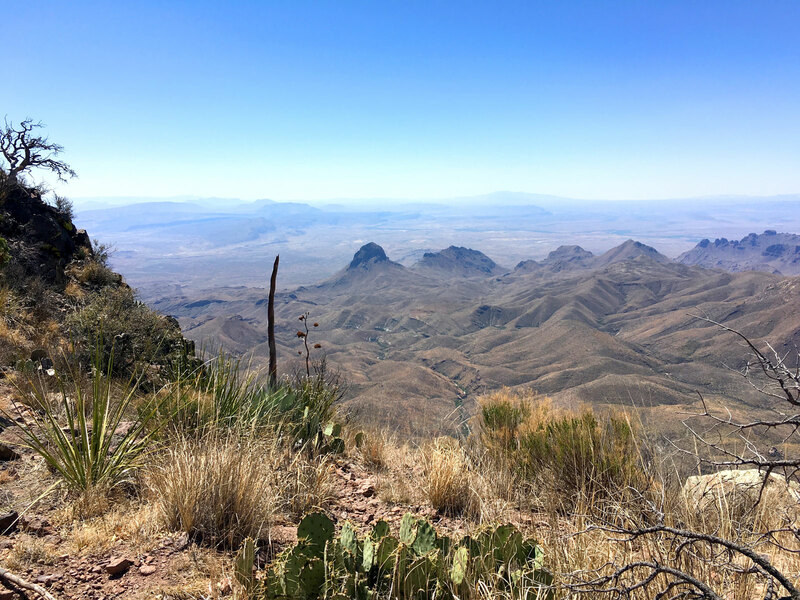 Tucked away in far southwestern Texas is a true gem of the National Park Service, Big Bend. As we’ve mentioned before, it is not an easy place to find, being between six and nine hours by car from any of the major population centers of eastern Texas. The nearest airports are in Midland and El Paso, 3 and 4.5 hours away themselves. As a result, it is among the least visited national parks in the continental U.S. and one of the most remote places in the entire country. I began my journey in Fort Worth, picking up a rental VW Passat after a few days visiting family. Meanwhile, Nick made his way by air to Midland for a midday interception. Driving south from the Midland/Odessa area there is no indication of anything scenic on the horizon. Flat, dusty fields littered with oil drilling equipment line Interstate 20. Turning south on Texas 18 and US 385, the landscape gets slowly but surely better. Eventually, mountains appear on the horizon and soon it is clear you’re about to arrive somewhere special. We entered Big Bend through Persimmon Gap, with countless lechuguilla stalks waving their welcome in the breeze. Approaching the pass leading into Chisos Basin. Big Bend is a large park (the size of the state of Rhode Island), with a variety of distinct regions to explore (VIEW MAP). The entirety lies within the Chihuahuan Desert that covers northern Mexico and parts of Texas, New Mexico and Arizona. It is an arid climate, receiving less than 15 inches of rain per year, but it isn’t without water. The Chisos Mountains rise in the center of the park, towering up to 6,000 feet above the desert floor. The resulting microclimate means the mountains are up to 20 degrees cooler and receive more rain than the lowlands. The Chisos are an oasis in the desert on many levels, providing habitat for some plant and animal species normally found much farther north and some that are found nowhere else at all. In the center of the mountains lies the visitation heart of the park, Chisos Basin. This is where the main lodging lies and where many of the most popular hiking trails begin. The entire southern border of Big Bend is shared with Mexico and defined by the Rio Grande. 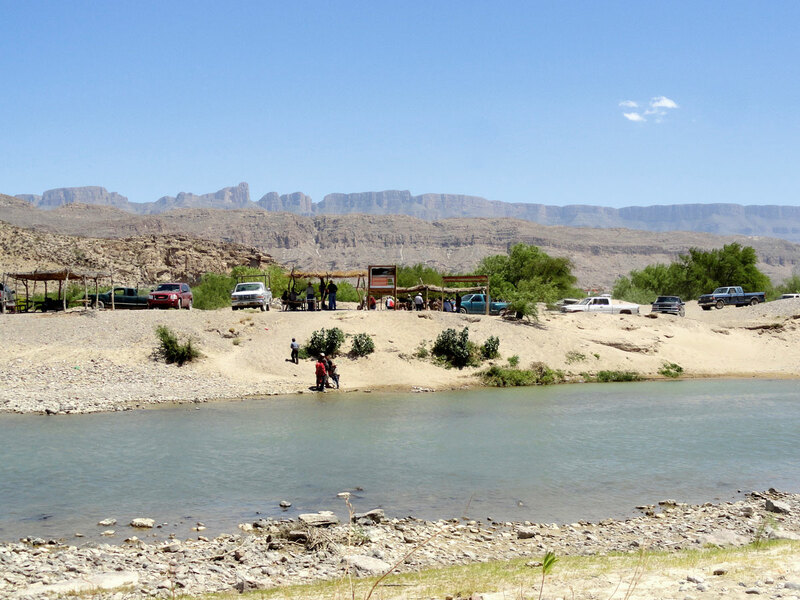 At the southeastern edge is a border crossing to the Mexican town of Boquillas del Carmen. Upriver to the west is one of the park’s most famous features, Santa Elena Canyon, with 1,500 foot vertical rock walls cut down by the Rio Grande. Overall, the park has a good balance of backcountry wilderness feel while maintaining accessibility. From one end of the park to the other it is over an hour’s drive, but the major sites are ultimately accessible by road. We opted to stay two nights in the Emory Peak Lodge Rooms in Chisos Basin. These are located a short walk from the visitor center, lodge and restaurant. We loved the location because these particular rooms are in an area with only about 20 units, more secluded than the large collection of motel-style buildings called Rio Grande and Casa Grande. Our room came with a decent bathroom, full bed plus twin bed, refrigerator and the all-important coffee maker. They’re not luxurious accommodations, but who wants to stay in their room when there is a porch with a view and so much to do outside anyway. 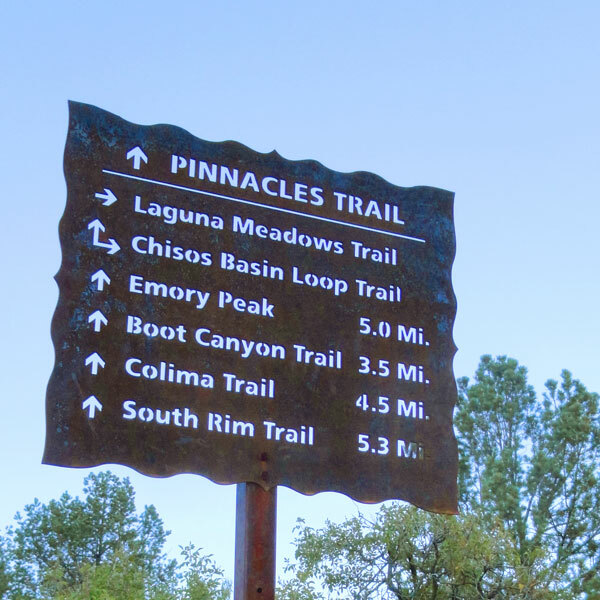 As a side bonus, the trailheads for the Laguna Meadows Trail and Pinnacles Trail are located in the driveway. When it’s time to eat, the Lodge Restaurant is the only option in the area, but it has enough variety on the menu, friendly servers and some good margaritas. There’s also an outdoor patio with an epic view of The Window formation – plan to sit there with a beverage for sunset. Arriving in the evening on Friday, we only had time to wander around the short Window View Trail and have dinner before it was time to head to bed. The following morning we set out on the first (and longest) hike of our entire trip, a 12 mile loop to the South Rim and back. Who needs a warm up hike? The South Rim is the high bluff of the central Chisos mountains, looming thousands of feet over the desert below. The view is widely considered to be among the most scenic in Texas. We began by heading up the Laguna Meadows Trail. It seemed more people went the opposite direction, starting up the Pinnacles Trail and making their way down Laguna Meadows. We found Laguna Meadows to be slightly less steep, but it’s a pretty big climb either direction, a little over 2,000 feet in elevation gain from the basin to the high point. The trail is fairly level at first, but starts gaining elevation quickly after the first mile. Soon we looked back and could see the whole Chisos Basin below us. After the major climb, the trail curves around the west side of Emory Peak (the highest in the park) and heads across the slightly more level Laguna Meadows. Around the six-mile mark is the view everyone goes to see. As you approach the rim, the mountain falls away and the view opens up. In the foreground stands ridge after ridge of peaks and valleys. The sightline extends to the Rio Grande and beyond into Mexico, with the huge opening of Santa Elena Canyon looking like a small crack from this distance. The South Rim Trail follows the edge of this bluff for about a half mile. We took a break under a tree to enjoy the picnic lunch we brought from the Basin Convenience Store with the spectacular view before us. Peregrine Falcon nesting season means a longer stretch of the trail along the edge is closed seasonally, so we had to begin our descent on the Boot Canyon Trail. This canyon has great scenery of its own, with rocky outcrops and more thick forest than we expected. After rounding a bend, the rock formation that gives the canyon its name comes into view. It looks as if some giant cowboy took an unfortunate tumble and ended up with one boot sticking straight up in the air. The trail then rises for a while before arriving at the top of Pinnacles Trail. At this point, 9.5 miles in, we were faced with a view of the lodge in the distance and the realization of just how far down we had to climb to get there. The top of Pinnacles Trail is also where the route to the summit of Emory Peak splits off. We briefly considered making the 1.2 mile trek up there, but it’s really too much to do both the South Rim and Emory in one day. Also, we remembered there was beer in the fridge. We downed a few of those on our porch and then had dinner back at the lodge restaurant. Later that evening we took in an always-informative ranger presentation in the campground amphitheater led by Ranger Jeanette on the top ten things that make Big Bend special. The next day was reserved for exploring the eastern side of the park. On our way out of Chisos Basin, we hiked a portion of the Lost Mine Trail, one of the most popular hikes in the park. The entire trail is 4.7 miles, but with our busy day ahead, we went only as far as the one-mile mark which has a great viewpoint into Juniper Canyon. Back on the main park road, we made our way 20 miles downhill to the Rio Grande Village area. Our destination was the Boquillas border crossing to Mexico. The town of Boquillas del Carmen, Mexico was a mining town for decades, but after the industry left it survived by hosting visitors from Big Bend via an unofficial border crossing. That practice was brought to an end in 2002 when security concerns shut down the uncontrolled border. It remained that way until the opening of an official customs station in 2013. We passed through the station and walked to the banks of the Rio Grande where a man in a small aluminum rowboat waits to ferry visitors across the border. Apparently we were visible as American tourists from quite a distance, because a man across the river began belting out “Cielito Lindo” on cue. After the 30-second boat trip, (the Rio Grande is not very grande in reality) we were greeted with “Welcome to Mexico” and ushered to a small canopy where several guides waited to take visitors into town. Boquillas del Carmen is about a mile from the crossing, so we were offered three transportation options: foot, horseback or burro. Obviously we chose burro. We were also introduced to our guide for our time in Mexico, Esteban Oñate. (We think you’re allowed to visit without a guide, but having a local to show us around was great, especially on our first visit.) 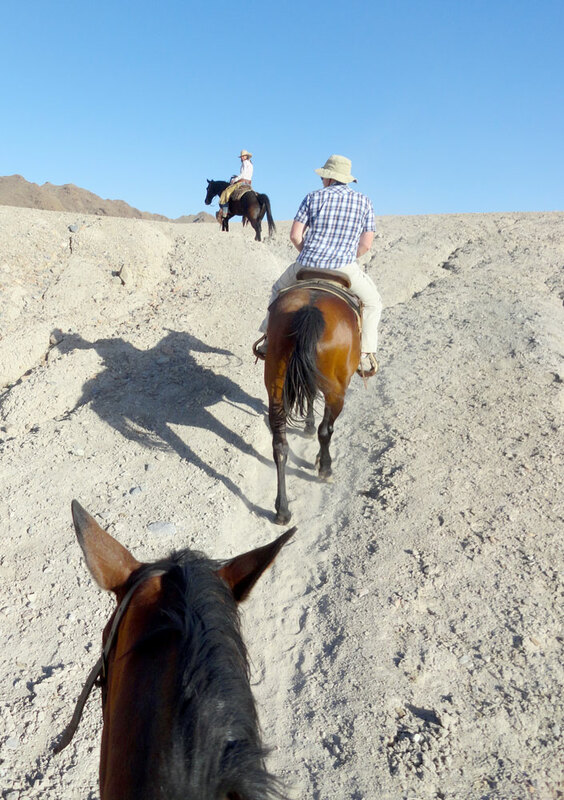 Esteban and our donkeys led us to the edge of Boquillas, where we dismounted and our rides were tied to a tree. Esteban has lived in Boquillas his whole life and knows the town and everyone in it well. He even takes people on long visits up to the old mountain mines around town. After a brief check-in at customs and the fee station for the Commission of Natural Protected Areas (CONANP), he took us for a walk through town and out to a large sand dune with a view of the Maderas del Carmen Mountains. Returning to town, we had a delicious lunch of cheese quesadillas and Carta Blanca beer at Boquillas Restaurant. After that it was time to saddle up and return to the river crossing on our burros. Everywhere we went in town we were approached by children selling small souvenirs, mostly woven bracelets and small wire sculptures of animals. They’re handmade and support the local community, so we purchased a few on our way out of town. There’s a fee for the tour guide and they also work on tips, so throw a couple extra dollars their way. Back in the U.S. we had to stop in the customs station to scan our passport and talk to a border agent in El Paso via video phone who asked a few standard questions. Overall, a brief, but enjoyable trip across the border that we highly recommend while in Big Bend. Also in the Rio Grande Village area there is a short trail that leads to the scenic mouth of Boquillas Canyon and a nice nature trail near the campground that goes across a wetland and up a low mesa with beautiful views of the Rio Grande. In keeping with the theme of four legged transportation that day, we booked a two-hour sunset horseback ride at Big Bend Stables in Study Butte, near the west park entrance. 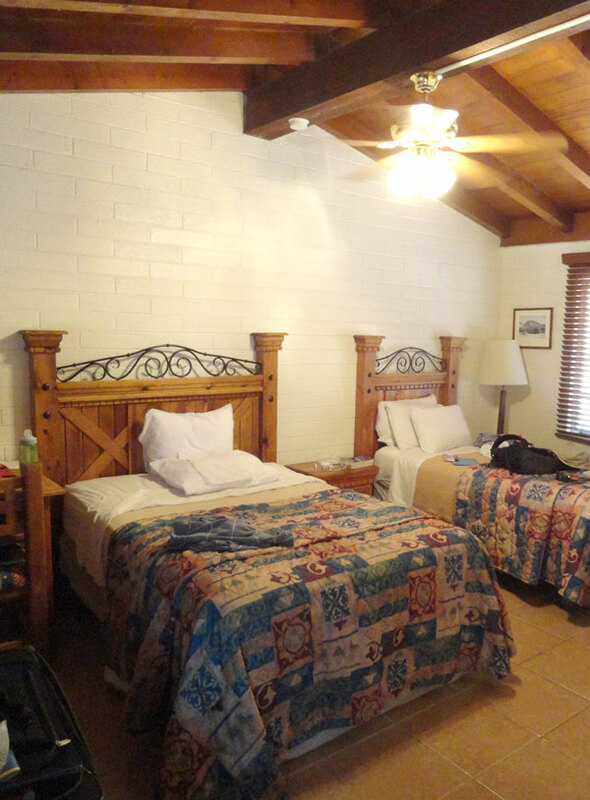 It’s about an hour drive from Rio Grande Village to get all the way across, so we booked our third night’s lodging at the Big Bend Resort for the convenience of exploring that side of the park. Study Butte/Terlingua has more amenities, like lodging and dining, but none of the charm and backwoods feel of Chisos Basin. The sunset ride begins at 6:30, and they recommend arriving a half hour early to get everything settled so you can be on the horse and ready to go. I was matched up with Indio and Nick was paired with Mannie. After a quick refresher course on horse steering controls, we were ready to set out into the desert with our excellent guide, Kellie, leading the way. With just one other couple on our ride, it was a laid back time, allowing us to take in the scenery and get lots of great photos. The route passes an abandoned mine from the area’s mercury mining days and follows dry arroyos before climbing up to a windy mesa filled with Ocotillo plants. It’s a more fun route than we’ve experienced on other trail rides, with some steep sections and rocky paths down from the mesa. Kellie even made a photo stop so we could have our picture taken on the horses. We loved that, because on a ride a few years ago we weren’t even allowed to take photos (we secretly did), and part of the fun is showing everyone you know that you were on a horse. As we made our way back to the stables, we observed both of west Texas’ famous sunsets, the first one being the orange alpenglow on the mountains to the east and the second being the traditional blazing sky after the sun dips below the horizon in the west. After the ride, we walked bow-legged into the Starlight Theater in the “Ghost Town” area of Terlingua for dinner. It’s probably the best known restaurant in the area, serving great Tex Mex food in an old theater building with a full schedule of live music. The entrance to Santa Elena Canyon. On Monday, we awoke to cloudy skies and cooler temperatures. We still had to visit the western side of the park and leave time for us to get to Marfa, Texas later in the afternoon, so we got started early. The 30-mile Ross Maxwell Scenic Drive takes visitors from Panther Junction Road south and west past all kinds of geologic beauty, ultimately ending at the gigantic mouth of Santa Elena Canyon. What looked like a small crack in a rock ledge from the top of the South Rim a couple days earlier is enormous up close. 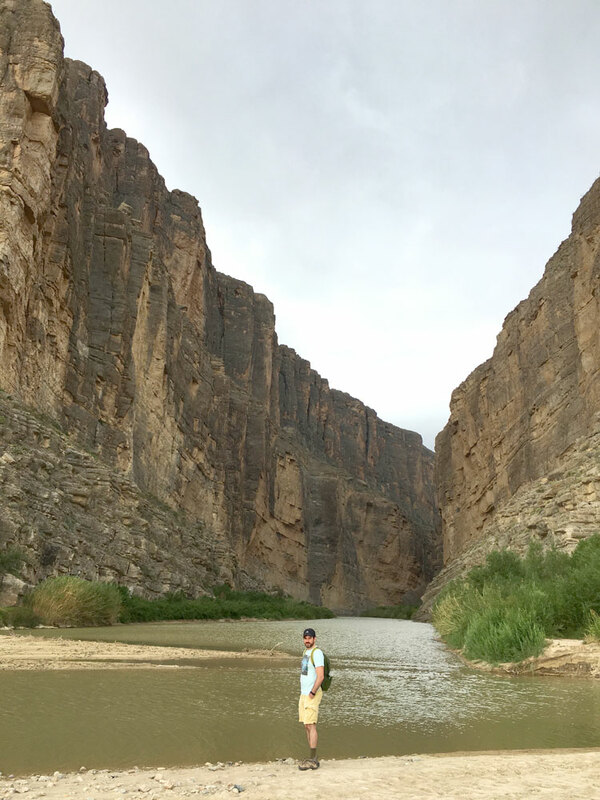 The Rio Grande has carved a narrow, 1,500 foot deep canyon with almost completely vertical walls. A moderate 1.5 mile trail begins at the parking lot at the end of the road and leads as far into the canyon as you can go without being on a boat. To put the scale of the canyon in perspective, we had to imagine Chicago’s Sears Tower standing inside with only its antennas poking out above the rim, it’s that tall, but only about as wide as a large city street. Returning to the car, we made our next stop at Castolon, a former army post set at the base of Castolon Peak. There are several historic buildings, the La Harmonia general store, exhibits on the border region and ranching implements showcasing the settlement’s more populated days. We asked a ranger about a possible hike on the Oak Springs Trail, but she wasn’t too enthusiastic about sending visitors there because of the extreme sensitivity of the area. Apparently, the Oak Springs Trail will soon be closed to visitors, which explains why it’s not marked on maps anymore. Instead, we found a nice shady spot at Sam Nail Ranch and enjoyed our picnic lunch. With a view of the Window and the still cloud-shrouded Chisos Mountains we were happy to have had a sunny day when we were on the South Rim. With that closing view, it was time to get on the road to Marfa. We’d spent nearly three days in Big Bend and enjoyed every minute of it. The park really is large and varied enough to spend an entire week exploring. On a second visit, a Rio Grande rafting trip and maybe a 4WD road trek with some camping would be on my list. Overall, we place Big Bend in the top tier of national parks for its combination of stunning scenery, unique local history, great day hikes and historic in-park lodging and dining. Check out the full gallery of images from our trip here. Parting shot of the cloudy Chisos Mountains from near the Sam Nail Ranch site. This entry was posted in Travelogues and tagged Big Bend, Big bend national park, Big Bend Stables, Boquillas del Carmen, Burro Rides, Chisos Basin, Chisos Basin Lodge, Rio Grande, Ross Maxwell, Santa Elena Canyon, Texas national parks. Bookmark the permalink.